​The summer months are fading and I feel as though I am springing forth, even though fall is just around the corner. These past three months have been so much about growth and discovery and opportunity. Ok, so that’s really just a poetic way to say change. Some of that change was sought after and some of it was, well, a total unprepared for surprise. I’ve always considered myself a person to roll with change, in fact, to even seek out change if things were beginning to feel just a little too much like a routine. My husband on the other hand, finds great comfort in structure and routine. As you can imagine, this makes for an interesting mix! I really have no great learnings or lessons to offer here right now about my summer of change. God is still working with me. Today I just wanted to take a step back toward a routine that I actually missed – writing, blogging and connecting with all of my wonderful Soul Friends. And I wanted to share a song with you that throughout July and August has actually become a prayer for me. A prayer for my heart, for my life, for my marriage, for my family, for my home and for my ministry. My hope is that it might become your prayer also. That together we will open our hearts and homes and every area of our lives and invite the Holy Spirit to flood each and every place. I invite you to download this free printable of this beautiful song’s chorus, print it out, frame it for your desk or home, tape it on your bulletin board. Make several copies and display them wherever you are inviting in the Holy Spirit. Even share on your social media accounts! 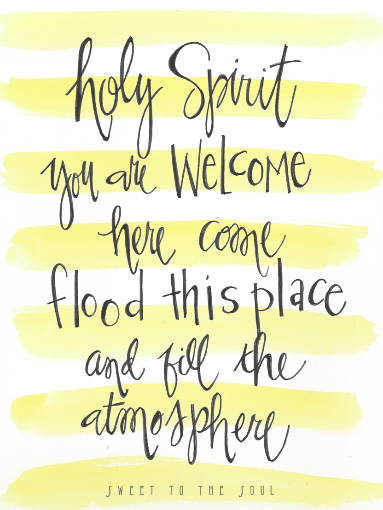 Wouldn’t it be wonderful to flood social media with the Holy Spirit?! ​Jana Kennedy-Spicer is a wife, mom and Nana who is passionate about inspiring and encouraging women on their daily walk with Christ. A woman rescued and repaired by the grace of God, she loves to share about the realness of God’s love, redemption and faithfulness. I absolutely love that song. What a perfect prayer! Thank you so much for the beautiful printable. It will be a perfect reminder for me every morning :). I love this song and it has been on replay for me all summer. I will be praying for you as you embrace the new that God is laying on your heart and that you are open to all that He has in store for you. So glad to be visiting you from Testimony Tuesday. Blessings upon your week. This song is on repeat around here lately! I love it! Beautiful! Thank you for this . I felt like I was reading what I would have written about my life and our summer. My husband's dad is 83 and moving in with us and he has spent most of the summer in TN clearing out his house and preparing to move him here with us in TX. My husband is not fond of change either and I usually a.m. but it is definitely been a hard summer for all of us so this blog post spoke to me . Thank you ! Love the printable thank you for that as well plan on printing it and framing it on my desk .